These images depict bone-marrow derived macrophages from C57BL/6 mice. Based on this experiment, the role of toll-like receptor 4 (TLR 4), Myd88 and MAPK for macrophage spreading was investigated. For measurement of experimental parameters, automatic segmentation of the image data is highly desirable. Details on the experiment are provided in (Wenzel et al., 2012). For these images, segmentation of the cells poses a challenge as the cells possess an irregular shape and some of the macrophages touch or overlap each other. This dataset can be used to assess an algorithm's ability to deal with challenging overlapping cell data. The image set consists of 25 images, each consisting of three channels. The samples were stained with DAPI and CD11b/APC. In addition to this, a merged image is provided. 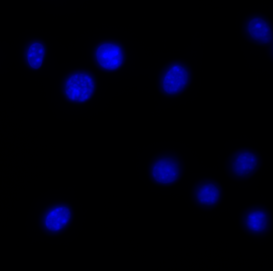 DAPI labels the nuclei and CD11b/APC the cell surface. In order to allow evaluation of segmentation performance for overlapping cells, an individual outline is provided for each cell. Outlines are named according to filename_number.tif, where filename denotes the filename of the corresponding fluorescent image and number is a counter. 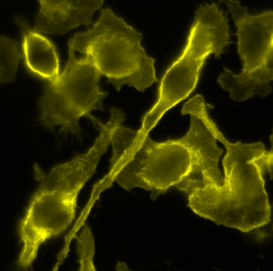 Note that no outlines are provided for cells or nuclei exceeding the image or cells that could not separated from each other due to very strong overlap or blur as such objects are not considered for evaluation. "We used image set BBBC020 from the Broad Bioimage Benchmark Collection [Ljosa et al., Nature Methods, 2012]." The BBBC020 images and ground truth are licensed under a Creative Commons Attribution-NonCommercial-ShareAlike 3.0 Unported License by Roland Lang.